History: One of the greats in New Japan wrestling, Masahiro Chono made his mark in the history books. After graduating from the New Japan Wrestling Academy, Chono wrestled some with the CWF before officially signing with NJPW. In April 1990, he teamed with Keiji Mutoh (the Great Muta) to win the IWGP Tag-Team Belts. The two held the belts for over 6 months before losing them to Hiroshi Hase and Kensuke Sasaki. In August 1992, Chono won over Ravishing Rick Rude in the tournament finals to win the NWA World Heavyweight Title (after Ric Flair signed with the WWF). He lost the title in January 1993 to the Great Muta. In 1994, Chono formed Team Wolf along with Hiro Saito and Hiroyoshi Tenzan. Teaming with Tenzan, Chono and Team Wolf won the IWGP Tag-Team titles over Shin'ya Hashimoto and Junji Hirata in a tournament final. These belts were vacated a month later (July '95) when Chono failed to show up for a match. It was later found out that the reason Chono missed was because of his father's death. Chono and Tenzan came back in July '96 to win the Tag-Team belts for Chono's third reign. The two soon after showed their dominance, hanging onto the belts for many months. Chono also started making appearances in World Championship Wrestling events. With Sonny Onoo as his manager, Chono appeared to be joining WCW for a while. But it was soon apparent what he was joining, as, during a December '96 Monday Nitro, Chono got rid of Onoo and showed his nWo colors, becoming the leader of the nWo Japan faction. In January '97, Chono and Tenzan lost the IWGP Tag-Team belts to Tatsumi Fujinami and Kengo Kimura. This did not faze Chono that much, however, as he began building nWo Japan, with aid from "Buff" Bagwell and Scott Norton, who joined him for a while in the NJPW. He soon got Tenzan, Saito, and Mutoh to join the faction, giving nWo Japan a strong prescence to contend with. 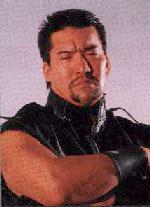 Although an ankle injury in August '97 slowed him some, Chono continued to be the powerful leader of nWo Japan. In October '97, Chono teamed with Mutoh to win the IWGP Tag-Team belts over Kensuke Sasaki and Kazuo Yamazaki. The two held the belts for 8 months until Mutoh was injured. Chono then teamed with his old partner Tenzan to win the titles again in the following tournament, which marked Chono's 5th IWGP Tag-Team Title Reign, with 2 different partners. The two lost the belts in July. In August '98, Chono won a major battle with Tatsumi Fujinami to earn the IWGP Heavyweight Title. He defended it for a month, then had to forfeit it due to a neck injury. Chono was out for a while, recovering, then returned in '99, feuding with various members of the former nWo Japan, including Keiji Mutoh/The Great Muta. He also battled against his old foe, Fujinami, as well as his former tag-team partner Tenzan. For the next two years, Chono continued to work in New Japan Pro Wrestling, with brief appearances in other federations. Currently, he is still fighting it out there, wrestling in various events overseas. The unbelievable career of Masahiro Chono continues onwards, as he once again seeks to regain his former prize, the IWGP Heavyweight Title. - NJPW Sumo Hall (February '86) = Chono was defeated by Tony St. Clair. - NJPW Sumo Hall (June '86) = Chono & Keiichi Yamada were beaten by Tatsutoshi Goto & the Black Cat. - NJPW Sumo Hall (October '86) = In a dark match, Chono lost to Tatsutoshi Goto. - NJPW Sumo Hall (December '86) = Chono forced Masa Funaki to submit. - NJPW Sumo Hall (February '87) = Chono was pinned by the Cuban Assassin. - NJPW Young Lions Cup '87 (March '87) = Chono won the Cup. - NJPW Sumo Hall (April '87) = Chono & Don Arakawa beat Riki Bassan & Shoku Kim. - NJPW Sumo Hall (June '87) = Chono & Kengo Kimura defeated Tony St. Clair & Kevin Von Erich. - WWA Title Tournament (January '88) = Chono lost in the first round to Tommy Rich. Mike George won the tournament. - NJPW Japan Cup Six-Man Elimination Tag Team League '88 (November 11 - December 9, '88) = Chono, Tatsumi Fujinami and Shinya Hashimoto lost in the Finals to Antonio Inoki, Riki Choshu and Hoshino. - NJPW Tokyo Dome '89 (Egg Dome) = Chono was pinned by Big Van Vader. - NJPW World Cup Tournament (November 24 - December 7, '89) = Chono made it through the League to get in the Tournament. He defeated Brad Rheingans, then lost to Riki Choshu, who went on to win the Tournament. - NJPW Sumo Hall (December 7, '89) = Chono pinned Manny Fernandez. - NJPW "New Japan in U.S.S.R" (December 31, '89) = Chono forced Chimur Zarasov to submit. - NJPW Super Fight (February '90) = Chono and Shinya Hasimoto lost to Antonio Inoki and Seiji Sakaguchi. Lou Thesz was the special referee. - AJPW US/Japan Wrestling Summit (April '90) = Chono and Riki Choshu were beaten by Masa Saito and Shinya Hasimoto, the IWGP Tag Champs. - NJPW Sumo Hall (June '90) = Chono & Keiji Mutoh retained the IWGP Tag-Team Titles, winning over Shinya Hashimoto & Masa Saito. - NJPW Sumo Hall (August '90) = Chono & Keiji Mutoh stayed the IWGP Tag Champs by beating the Destruction Crew. - NJPW "New Japan in China" (September 1st, '90) = Chono defeated Takayuki Iizuka in the first round of the Japan/China Friendship Tournament. The next day, Chono beat Kengo Kimura and Kensuke Sasaki to win the Tournament. - NJPW "Inoki's 30th Wrestling Anniversary" (September 30th, '90) = Chono beat TNT. - NJPW Budokan Hall (November '90) = Chono & Keiji Mutoh were defeated by Hiroshi Hase & Kensuke Sasaki. - NJPW Sumo Hall (December 13, '90) = Chono & Keiji Mutoh won over Bam-Bam Bigelow & Bad News Allen. - NJPW Legends Show (December 26, '90) = Chono managed to defeat Lou Thesz. - NJPW Tokyo Dome '91 (Starrcade in Egg Dome) = Chono & Masa Saito lost to Arn Anderson and Barry Windham. - NJPW Sumo Hall (April '91) = Chono & Masa Saito defeated Kokina & Samu. - WCW Clash of the Champions XV (June '91) = Chono & Hiro Hase lost to the IWGP Tag Champs the Steiner Brothers. - NJPW Sumo Hall (August 9, '91) = Chono and Shinya Hashimoto fought to a Draw. - NJPW Sumo Hall (August 10, '91) = Chono took out Bam-Bam Bigelow. - NJPW Sumo Hall (August 11, '91) = Chono won the G-1 Climax Tournament, forcing Shinya Hashimoto to submit in the Semis then defeating Keiji Mutoh in the Finals. - NJPW Super Grade Tag League I (October 5-17, '91) = Chono and Bam Bam Bigelow lost in the Semi-Finals to Tatsumi Fujinami and Big Van Vader, who went on to win the League. - NJPW Budokan Hall (November '91) = Chono lost to the ICWF Champion Tatsumi Fujinami. - NJPW Tokyo Dome '92 (Starrcade in Egg Dome) = Chono was defeated by Lex Luger, who retained the the WCW World Title. - NJPW Sumo Hall (April '92) = Chono & Keiji Mutoh were beaten by Bam-Bam Bigelow & Big Van Vader. - NJPW Budokan Hall (June '92) = Chono fell to Riki Choshu. - NJPW G1 Climax '92 (August 6-12, '92) = Chono defeated Tony Halme, Scott Norton, Keiji Mutoh and "Ravishing" Rick Rude to win the vacated NWA World Title. - NJPW Super Grade Tag League II (October 8-21, '92) = Chono and Tony Halme competed in the league, which was won by Riki Choshu and Shinya Hashimoto. - WCW Halloween Havoc '92 = Chono retained the NWA World Title, but lost via DQ to Ravishing Rick Rude. - NJPW Sumo Hall (November '92) = Chono stayed the NWA World Champ, beating Scott Steiner. - WCW Starrcade '92 = Chono retained the NWA World Title by defeating the Great Muta. - NJPW Tokyo Dome '93 (Fantasic Story) = Chono lost the NWA World Title to Kejii Mutoh. - NJPW Sumo Hall (February '93) = Chono, Keiji Mutoh & Shinya Hashimoto were beaten by Kengo Kimura, Shiro Koshinaka & the Great Kabuki. - NJPW Wrestling Dontaku '93 = Chono & Shinya Hashimoto lost to the IWGP Tag Champs the Hellraisers. - NJPW Sumo Hall (April '93) = Chono & Takayuki Iizuka fell to the Hellraisers. - NJPW Budokan Hall (June 15, '93) = Chono, Shinya Hashimoto, Hiroshi Hase, Tatsumi Fujinami & Riki Choshu fought in an "Elimination" match with Genichiro Tenryu, Ashura Hara, Super Strong Machine, Tatsutoshi Goto, & Takashi Ishikawa. Chono, Hashimoto & Choshu "survived". - NJPW Budokan Hall (June 17, '93) = Chono defeated Koki Kitihara. - NJPW Sumo Hall (August 2, '93) = Chono, Shinya Hashimoto & Tatsumi Fujinami were defeated by Genichiro Tenryu, Ashura Hara & Takashi Ishizawa. - NJPW G1 Climax '93 (August 2-8, '93) = Chono beat Ashura Hara and Hiromichi Fuyuki, then lost to Hiro Hase. - NJPW Sumo Hall (August 7, '93) = Chono & Manabu Nakanishi fell to Takashi Ishikawa & the Super Strong Machine. - NJPW Sumo Hall (August 8, '93) = Chono, Keiji Mutoh, Tatsumi Fujinami, Takayuki Iizuka & Michiyoshi Ohara were beaten by Shiro Koshinaka, Kendo Kimura, Kuniaki Kobayashi, Masashi Aoyagi & the Great Kabuki. - NJPW Super Grade Tag League III (October 8 - November 4, '93) = Chono & Shinya Hashimoto competed in the League, which was won by Keiji Mutoh & Hiroshi Hase. - NJPW Tokyo Dome '94 (Battlefield) = Chono was beaten by the IWGP Champion Shinya Hashimoto. - NJPW Budokan Hall (February '94) = Chono fell to Tatsutoshi Goto. - NJPW Sumo Hall (February 17, '94) = Chono, Riki Choshu, Hiroshi Hase, Tatsumi Fujinami & Osamu Kido won a "Three Falls" match over Michiyoshi Ohara, Kendo Kimura, Shiro Koshinaka, Tatsutoshi Goto & the Great Kabuki. - NJPW Wrestling Dontaku '94 = Chono forced Yoshiaki Fujiwara to submit. - NJPW Budokan Hall (June '94) = Chono & Keiji Mutoh defeated Scott Norton & Mike Enos. - NJPW Sumo Hall (August 3, '94) = Chono was pinned by Riki Choshu. - NJPW Sumo Hall (August 4, '94) = Chono won over Keiji Mutoh. - NJPW Sumo Hall (August 5, '94) = Chono beat Osamu Kido. - NJPW Sumo Hall (August 6, '94) = Chono defeated Yoshiaki Yatsu. - NJPW Sumo Hall (August 7, '94) = Chono took out Yoshiaka Fujiwara, then forced the Power Warrior to submit to win the 1994 G-1 Climax Tournament. - NJPW Sumo Hall (October 30, '94) = Chono & the Super Strong Machine defeated the Hellraisers, but then lost to Keiji Mutoh & Hiroshi Hase in the Finals of the 1994 Super Grade Tag-Team League. - NJPW Tokyo Dome '95 (Battle Seven) = Chono & Sabu defeated Tatsumi Fujinami and Junji Hirata. - NJPW Sumo Hall (February '95) = Chono, Hiro Saito & Hiroyoshi Tenzan won over Riki Choshu, Hiroshi Hase & Kensuke Sasaki. - WAR Sumo Hall (March '95) = Chono & Hiromichi Fuyuki beat Shiro Koshinaka & Kengo Kimura. - Weekly Pro At Tokyo Dome (April 2, '95) = Chono lost to the IWGP Champ, Shinta Hashimoto. - NJPW Pyongyang Sports Festival (April 28-29, '95) = Chono & Hiro Saito defeated El Samurai & Tadao Yasuda. The next day, Chono & Scott Norton beat Akira Nogami & Takayuki Iizuka. - NJPW Wrestling Dontaku '95 = Chono & Hiromichi Fuyuki lost to Shiro Koshinaka and Terry Funk. - NJPW Budokan Hall (June '95) = Chono & Hiro Saito were beaten by Riki Choshu & Kensuke Sasaki. - NJPW Sumo Hall (August 11, '95) = Chono fought to a Draw with Ric Flair. - NJPW Sumo Hall (August 12, '95) = Chono was beaten by Keiji Mutoh. - NJPW Sumo Hall (August 13, '95) = Chono defeated Shiro Koshinaka. - NJPW Sumo Hall (August 14, '95) = Chono lost to Shinya Hashimoto, eliminating him from the 1995 G-1 Climax Tournament. - NJPW Sumo Hall (August 15, '95) = Chono & Hiroyoshi Tenzan won over Tatsutoshi Goto & Shiro Koshinaka. - NJPW Super Grade Tag League V (October 15-30, '95) = Chono and Hiroyoshi Tenzan defeated Junji Hirata and Shinya Hashimoto in the Semis, then beat Osamu Kido and Kazuo Yamazaki to win the League. - UWFI Sumo Hall (November '95) = Chono & Hiroyoshi Tenzan took out Yoshihiro Takayama & Yoji Anjoh. - WCW Starrcade '95 = Chono was beaten by Lex Luger. - NJPW Tokyo Dome '96 (Wrestling War) = Chono lost to Shiro Koshinaka. - NJPW Tokyo Dome '96 (Battle Formation '96) = Chono forced Lex Luger to submit. - NJPW Sumo Hall (August 2, '96) = Chono defeated Satoshi Kojima. - NJPW Sumo Hall (August 4, '96) = Chono was beaten by Shiro Koshinaka. - NJPW Sumo Hall (August 5, '96) = Chono forced Kazuo Yamazaki to submit. - NJPW Sumo Hall (August 6, '96) = Chono took out Keiji Mutoh, then lost in the finals of the 1996 G-1 Climax tournament to Riki Choshu. - NJPW Japan/US All-Star Tournament (September 19-23, '96) = Chono lost in the first round to Sting. Kensuke Sasaki won the Tournament. - NJPW Super Grade Tag League VI (October 13 - November 1, '96) = Chono and Hiroyoshi Tenzan competed in the League, which was won by Scott Norton and Shinya Hashimoto. - NJPW Tokyo Dome '97 (Wrestle World) = Chono defeated Soiji Nakamaki. Later in the night, Chono and Hiroyoshi Tenzan lost the IWGP Tag Titles to Kengo Kimura and Tatsumi Fujinami. - WCW Clash of the Champions XXXIV (January '97) = Chono defeated Alex Wright. - WCW/nWo Souled Out '97 = Chono beat Chris Jericho. - NJPW Sumo Hall (February '97) = Chono, Scott Norton & Buff Bagwell defeated Riki Choshu, Kensuke Sasaki & Tadao Yasuda. - NJPW Tokyo Dome '97 (Battle Formation '97) = Chono was pinned by Keiji Mutoh. - NJPW Strong Style Evolution (May '97) = Chono and the Outsiders defeated Keiji Mutoh and the Steiner Brothers. - NJPW Budokan Hall (June '97) = Chono & the nWo Sting were beaten by the IWGP Tag-Team Champs, Satoshi Kojima & Manabu Nakanishi. - WCW Bash At The Beach '97 = Chono and the Great Muta lost to the Steiner Brothers. - NJPW Sumo Hall (August 1, '97) = Chono forced Michiyoshi Ohara to submit. - NJPW Sumo Hall (August 2, '97) = Chono fell to Shinya Hashimoto, being eliminated from the 1997 G-1 Climax tournament. - NJPW Three Gun Tag Team Tournament (September 12-20, '97) = Chono and the nWo Sting lost the first match to Kensuke Sasaki and Kensuke Yamasaki, who went on to win the Tournament. - NJPW Budokan Hall (September 23, '97) = Chono & the Great Muta won over Kensuke Sasaki & Kazuo Yamazaki. - NJPW Final Battle Hall (November 2, '97) = Chono and Keiji Mutoh retained the IWGP Tag Titles, beating Tatsumi Fujinami and Genichiro Tenryu. - NJPW Super Grade Tag League VII (November 18 - December 8, '97) = Chono and Keiji Mutoh beat Manabu Nakanishi and Shinya Hashimoto to win the League. - NJPW Riki Choshu Retirement (January '98) = Chono defeated Shiro Koshinaka. - NJPW Budokan Hall (February '98) = Chono was beaten by Shiro Koshinaka. - NJPW Tokyo Dome '98 (The Inoki Final) = Chono and Keiji Mutoh retained the IWGP Tag Titles over Shinya Hashimoto and Osamu Nishimura. - NJPW Top of the Super Juniors '98 = Chono and Hiroyoshi Tenzan competed in the League, which was won by Yuji Nagata and Kensuke Sasaki. - NJPW IWGP Tag-Team Title Tournament '98 (June 3-5, '98) = Chono and Hiroyoshi Tenzan defeated Kensuke Sasaki and Kazuo Yamazaki, and Shiro Koshinaka and Genichiro Tenryu to win the IWGP Tag Belts. - NJPW Sumo Hall (July 30, '98) = Chono won over Manabu Nakanishi. - NJPW Sumo Hall (August 1, '98) = Chono defeated Shiro Koshinaka. - NJPW Sumo Hall (August 2, '98) = Chono was beaten by Kaduo Yamazaki, which eliminated him from the 1998 G-1 Climax tournament. - NJPW Rising the Next Generation (August '98) = Chono won the IWGP Title from Tatsumi Fujinami. - NJPW St. Valentine's Day Massacre (February '99) = Chono, Akira, & the nWo Sting defeated Hiroyoshi Tenzan, Satoshi Kojima, & Hiro Saito. - NJPW Tokyo Dome (April '99) = Chono fought to a Double Knockout against Atsushi Onita in a "No Ropes Explosive Barbed Wire" Match. - NJPW Budokan Hall (June '99) = Chono & Don Frye were beaten by Keiji Mutoh & Satoshi Kojima. - NJPW Sumo Hall (August 13th, '99) = Chono defeated Manabu Nakanishi in the G-1 Climax League '99. - NJPW Sumo Hall (August 14th, '99) = Chono beat Kazuo Yamazaki in the G-1 Climax League '99. - NJPW Sumo Hall (August 15th, '99) = Chono lost to Hiroyoshi Tenzan in the G-1 Climax League '99. Manabu Nakanishi won the League. - NJPW G1 Climax Tag-Team League '99 (September 10-23, '99) = Chono and Don Frye teamed in the league, which was won by Scott Norton and Keiji Mutoh. - NJPW Tokyo Dome (October '99) = Chono, teaming with Don Frye, defeated Satoshi Kojima and Scott Norton. - NJPW Tokyo Dome (January '00) = Chono forced Keiji Mutoh to submit. - NJPW Sumo Hall (February '00) = Chono lost to Kensuke Sasaki. In the rematch on the same night, Chono forced Sasaki to submit. - NJPW Dome Impact 2000 (April) = Chono won, via DQ, over the Great Muta. - NJPW Wrestling Dontaku 2000 (May) = Chono defeated Tatsumi Fujinami. - NJPW Budokan Hall (June '00) = Chono forced Yutaka Yoshie to submit. - NJPW Sumo Hall (August 12th, '00) = Chono defeated Junji Hirata in the G-1 Climax League '00. - NJPW Sumo Hall (August 13th, '00) = Chono lost to Manabu Nakanishi in the G-1 Climax League '00. Kensuke Sasaki won the League. - AJPW Budokan Hall (September '00) = Chono won over Masa Fuchi. - NJPW Do Judge! (October '00) = Chono & Tatsotoshi Goto defeated Masa Fuchi & Shiro Koshinaka. - NJPW Wrestling World 2001 (January) = Chono was beaten by Kensuke Sasaki. - NJPW Sumo Hall (February '01) = Chono was forced to submit to Don Frye. - NJPW Osaka Dome (April '01) = Chono, Hiroyoshi Tenzan, & Satoshi Kojima defeated Keiji Mutoh, Taiyo Kea, & Jinsei Shinzaki. - NJPW Wrestling Dontaku 2001 (May) = Chono, Hiroyoshi Tenzan, & Satoshi Kojima were beaten by Keiji Mutoh, Taiyo Kea, & Hiroshi Hase. - NJPW Budokan Hall (June '01) = Chono, Akira Nogami, & Hiroyoshi Tenzan lost to Jinsei Shinzaki, Taiyo Kea, & Jushin Liger. - AJPW Budokan Hall (October 27, '01) = Chono was beaten by the All Japan Triple Crown Champion, Keiji Mutoh. - NJPW International Center (October 28, '01) = Chono & Mike Rotunda defeated Hiroyoshi Tenzan & Satoshi Kojima. - IWGP Tag Title Tournament (March 8-24, '02) = Chono & Hiroyoshi Tenzan won over Kensuke Sasaki & Shiro Koshinaka, Hiroshi Tanahashi & Kenzo Suzuki, and Yuji Nagata & Manabu Nakanishi to win the tournament. - NJPW "Fighting Spirit Memorial Day" (May 28, '02) = Chono pinned Yuji Nagata. - NJPW Budokan Hall (June 7, '02) = Chono & Scott Norton defeated Kenzo Suzuki & Hiroshi Tanahashi. - NJPW Furitsu Gym (August 3, '02) = Chono was forced to submit to Yuji Nagata. - NJPW Sumo Hall (August 10, '02) = Chono forced Hiroyoshi Tenzan to submit. - NJPW Sumo Hall (August 11, '02) = Chono won the 2002 G-1 Climax, beating Yoshihiro Takayama. - NJPW Tokyo Dome (October 14, '02) = Chono defeated Joanie Laurer. - NJPW International Center (October 26, '02) = Chono fought to a Draw with the IWGP Champion, Yuji Nagata. - NJPW Triathlon Survivor League 2002 (November/December) = Chono, Tatsumi Fujinami & Hiroyoshi Tenzan competed in the league, which was won by Manabu Nakanishi, Osamu Nishimura & Yutaka Yoshie. - NJPW Tokyo Dome (January 4, '03) = Chono & Manabu Nakanishi fell to Hiroyoshi Tenzan & Satoshi Kojima. - Pro Wrestling Noah Budokan Hall (January 10, '03) = Chono & Mitsuharu Misawa lost to Kenta Kobashi & Akira Taue. - NJPW Sumo Hall (February 16, '03) = Chono & Hiroyoshi Tenzan stayed the IWGP Tag Champs, winning over Tadao Yasuda & Kazunari Murakami. - NJPW Tokyo Dome (May 2, '03) = Chono fell to the NOAH GHC Champion, Kenta Kobashi. - NJPW Budokan Hall (June 13, '03) = Chono & Hiroyoshi Tenzan lost the IWGP Tag Titles to Yutaka Yoshie & Hiroshi Tanahashi. - NJPW Green Dome (July 21, '03) = Chono was beaten by the IWGP Champ, Yoshihiro Takayama. - NJPW Sumo Hall (August 15, '03) = Chono fought to a Draw with Jun Akiyama. - NJPW Sumo Hall (August 16, '03) = Chono & Josh Barnett beat Tadao Yasuda & Mitsuya Nagai. - NJPW Prefectural Gym (August 28, '03) = Chono lost to Yoshihiro Takayama in a "Steel Cage" Match. Takayama won the vacated IWGP Title. - NJPW Tokyo Dome (October 13, '03) = Chono fell to Hulk Hogan. - NJPW G-1 Climax Tag-Team League '03 (October) = Chono & Jushin Liger competed in the league, which was won by Hiroyoshi Tenzan & Osamu Nishimura. - NJPW Tokyo Dome (January 4, '04) = Chono & Hiroyoshi Tenzan fell to Bob Sapp & Keiji Mutoh. - NJPW IWGP Title Tournament (February 15, '04) = Chono lost in the first round to Genichiro Tenryu. Hiroyoshi Tenzan won the tournament. - NJPW Sumo Hall (March 28, '04) = Chono was forced to submit to Yuji Nagata. - NJPW Nexess (May 3, '04) = Chono & Kazunari Murakami lost to the IWGP Tag Champs, Yoshihiro Takayama & Minoru Suzuki. - NJPW Sumo Hall (August 13, '04) = Chono defeated Minoru Suzuki. - NJPW Sumo Hall (August 14, '04) = Chono fought to a DCO with Shinsuke Nakamura. - NJPW Sumo Hall (August 15, '04) = Chono lost, via DQ, to Shinsuke Nakamura in the '04 G-1 Climax. - NJPW Sumo Hall (October 9, '04) = Chono & Don Frye won a "Lumberjack Death" Match over Hiroyoshi Tenzan & Yuji Nagata. - NJPW Masa Chono's 20th Anniversary (November 3, '04) = Chono & Riki Choshu took down Hiroyoshi Tenzan & Yuji Nagata. - NJPW Toukon Festival (November 13, '04) = Chono & Riki Choshu lost an "Elimination" Match to Yuji Nagata & Osamu Nishimura. - NJPW Prefectural Gym (December 11, '04) = Chono forced Yuji Nagata to submit. - NJPW Wrestling World '05 (January 4) = Chono won a "Dog Fight" Match over Riki Choshu and Hiroyoshi Tenzan. - NJPW Sumo Hall (February 20, '05) = Chono, Manabu Nakanishi, Minoru Suzuki, & Mitsuya Nagai won an "Elimination" Match over Yuji Nagata, Kensuke Sasaki, Shinsuke Nakamura, & Hiroshi Tanahashi. - NJPW Sumo Hall (March 26, '05) = Chono was forced to submit to Hiroyoshi Tenzan. - NJPW New Japan Cup '05 (April) = Chono defeated Tiger Mask IV, then fell to Manabu Nakanishi. Hiroshi Tanahashi won the tournament. - NJPW Tokyo Dome (May 14, '05) = Chono & Jushin Thunder Liger were beaten by Mitsuharu Misawa & Tatsumi Fujinami. - AJPW Heavy Fighting Yoyogi (July 26, '05) = Chono, Taiyo Kea, TAKA Michinoku, & Jamal defeated Chuck Palumbo, Johnny Stamboli, Giant Bernard, & Taru. - NJPW G-1 Climax '05 (August) = Chono won over Tatsumi Fujinami, Shinsuke Nakamura, and Kazuyuki Fujita to win the league. - NJPW Tokyo Dome (October 8, '05) = Chono lost a "Triple Threat" Match to Brock Lesnar, who won the IWGP Heavyweight Championship. Kazuyuki Fujita was the other participant. - NJPW Tokyo Dome (January 4, '06) = Chono & Hiroyoshi Tenzan retained the IWGP Tag-Team Titles, defeating Shiro Koshinaka & Takao Omori. - NJPW Sumo Hall (February 19, '06) = Chono & Hiroyoshi Tenzan stayed the IWGP Tag-Team Champions, beating Manabu Nakanishi & Giant Bernard. - NJPW Sumo Hall (March 19, '06) = Chono & Hiroyoshi Tenzan kept the IWGP Tag-Team straps, taking down Yuji Nagata & Naofumi Yamamoto. - NJPW New Japan Cup (April '06) = Chono fell in the first round to Hiroshi Tanahashi. Giant Bernard won the tournament. - NJPW G1 Climax Tag-Team League '06 (November/December) = Chono & Shinsuke Nakamura defeated Giant Bernard & Travis Tomko and Koji Kanemoto & Hiroshi Tanahashi to win the league. - NJPW Wrestle Kingdom in Tokyo Dome (January 4, '07) = Chono & Keiji Mutoh beat Satoshi Kojima & Hiroyoshi Tenzan. - NJPW Sumo Hall (February 18, '07) = Chono & Milano Collection AT lost to Hiroyoshi Tenzan & Taru. - NJPW New Japan Cup '07 (March) = Chono took down Riki Choshu, then fell to the eventual winner, Yuji Nagata. - NJPW G1 Climax '07 (August) = Chono competed in the league, which was won by Hiroshi Tanahashi. - NJPW Sumo Hall (August 11, '07) = Chono was pinned by Togi Makabe. - NJPW Sumo Hall (August 12, '07) = Chono, Giant Bernard, & Akebono defeated Takashi Iizuka, Manabu Nakanishi, & Naofumi Yamamoto. - NJPW Explosion '07 (October 8) = Chono, Riki Choshu, Jushin Liger, Super Strong Machine, & Akira took down Mitsuhide Hirasawa, Takashi Iizuka, Manabu Nakanishi, Takashi Uwano, & Naofumi Yamamoto. - NJPW Destruction '07 (November 11) = Chono, Riki Choshu, Jushin Liger, Super Strong Machine, & Akira beat Mitsuhide Hirasawa, Takashi Iizuka, Taichi Ishikari, Tetsuya Naito, & Takashi Uwano. - NJPW Wrestle Kingdom in Tokyo Dome II (January 4, '08) = Chono, Riki Choshu, Tatsumi Fujinami, Jushin Liger, & Akira defeated Shuji Kondo, Brother Yasshi, Gedo, Jado, & Taru. - NJPW Sumo Hall (February 17, '08) = Chono, Riki Choshu, Shiro Koshinaka, & Super Strong Machine won over Tomohiro Ishii, Hiroyoshi Tenzan, Gedo, & Jado. - NJPW Destruction '08 (October 13) = Chono & Hiroshi Tanahashi fell to Manabu Nakanishi & Yutaka Yoshie. - NJPW Wrestle Kingdom III (January 4, '09) = Chono, Kurt Angle, Riki Choshu, & Kevin Nash won over Karl Anderson, Giant Bernard, Takashi Iizuka, & Tomohiro Ishii.